ClickFunnels Is A Better Alternative To SamCart For The Price! SamCart is a popular choice if you want to sell online, they provide a lot of key features which we’ll be covering along with exploring their different pricing options. Don’t let the SamCarts pricing intimidate you. While they do have options for hundreds of dollars per month, they also have a less expensive plan for under $20. It’s nice that there’s a cheap basic plan for $19/mo, but it’s missing a few features that are important to have and it’s far from being the perfect solution. Having said that, the higher-tier SamCart options are more than useable. You need to get the $99 per month plan (called “Pro”) if you’re already selling at a higher volume because the added processing fees that are charged to the Basic plan can really start to add up. With the Pro plan for $99/mo, there’s 0% added for processing fees. Another benefit of the Pro plan ($99/mo) over the Basic plan ($19/mo) is that the Pro plan removes SamCart branding. With the cheaper plan, your store will be branded by SamCart and looks less professional. This could potentially even distract visitors from your site. If this was the only difference between their plans then it would be a lot easier to recommend the Basic plan, but there are some other key distinctions. How’s the Support if You Need Help? Basic plan SamCart users get a lower tier of customer service. In other words, the support you receive won’t be as good if you’re on the cheap plan. Their Pro ($99/mo) and Premium ($199/mo) plans come with priority support and dedicated support. If the more expensive plans have premium support, it only stands to reason that the Basic members get worse support. Cart Abandonment (Prospectus) is another feature that’s missing from the Basic plan. Have you ever been shopping online, filling up your cart, then something distracted you and you left? It happens all the time. This feature will send an email reminding your customers that they have items in their cart, resulting in more sales. The Pro plan also offers recurring subscriptions, more templates, 1-click upsells, advanced stats, webhooks and a lot more. The Premium Plan takes it a step further with the Dunning subscription saver which is huge for sites that rely heavily on subscribers and the Affiliate Center. SamCart is pretty solid if you’re simply looking for the limited set of features that it provides and you fit the very specific use for it. We’re not huge fans of their lower tier plan because it has a few red flags that just make it not viable for serious shops. But, we also use another checkout platform that I think you would love. While SamCart has a host of crucial features that can really make a difference, there’s another option out there that may be a better fit for you. To quickly sum it up: It does what SamCart does, but it also does more and is a lot more versatile. I going to be quickly comparing the ClickFunnels $97 plan to SamCart’s $99 plan. I going to assume that the $19/mo from SamCart won’t be adequate for the majority of you due to its limitations. If that’s not the case and SamCart meets your needs then you’re all set. If you want more for your money then you might consider reading on. As we discussed SamCart offers a shopping cart platform for selling online. That’s their bread and butter and they do a pretty decent job. However, ClickFunnels costs the same and has a great cart that integrates easily with a number of different services to help you make the most of all your hard work. ClickFunnels isn’t just a pretty template, it’s backed up by years of data and optimized to ensure that the whole shopping process is as easy as possible for your visitors. Not only that, it helps you find buyers who are not as far along in the buying process. They may still be researching or just looking for some information. ClickFunnels will help you keep in touch with them throughout the process so that when they are ready to but they will know where yo find you. The software will help you get people into the funnel. SamCart helps with the last stages of the buying process but isn’t as robust at helping you actually find and convert visitors into customers. When it comes to eCommerce and setting up an online business there are a lot of moving parts and a lot of different platforms to choose from. It can feel intimidating since the stakes are high and you want your business to succeed. The best way to ensure that you succeed is to make sure that you’re using a platform that gives you the freedom to work on what’s important. Sam Cart and ClickFunnels are two popular choices for people who are selling online. While they share a lot of similarities, they also some big differences which determine which one could be the better choice for you. Regardless of which option you go for, the most important thing is to just get started. Both SamCart and ClickFunnels have a trial so you have nothing to lose if you try them out. One thing I don’t like about SamCart, you can’t customize the checkout. It’s crazy! So you can do basic edits but ClickFunnels had a complete checkout builder! You can also run abandon emails to people who leave the checkout! This is awesome and you can get back at least 30% of sales. 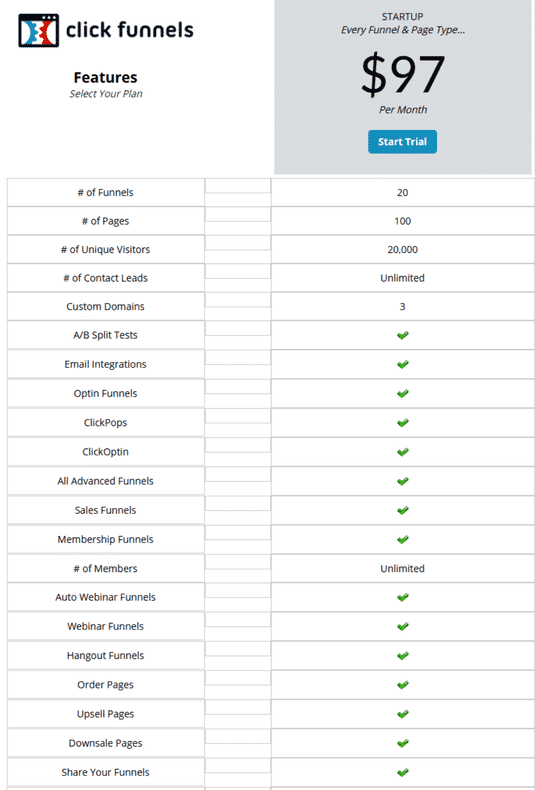 ClickFunnels is a great SamCart alternative! I actually did a review on ClickFunnls if you want to get some more information on it to help you. I recommend ClickFunnels it’s a much better option!